One semester course in hand building where students will learn basic construction techniques and surface treatment. Pinch, coil and slab methods will be emphasized. Glazes and underglazes will be used to enhance the pieces. Sculptural work will also be explored. 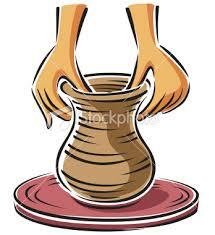 Individual instruction on the potter’s wheel will be available. Pieces are created in red and white clay. THROWN POTTERY – Ware created on the potter’s wheel.